It bothers me to no end how this film had to use the number three rather than spell it out. This looks incredibly ugly in a title. How cheap were they? Did the e’s in the font on the film’s cover look too ugly? 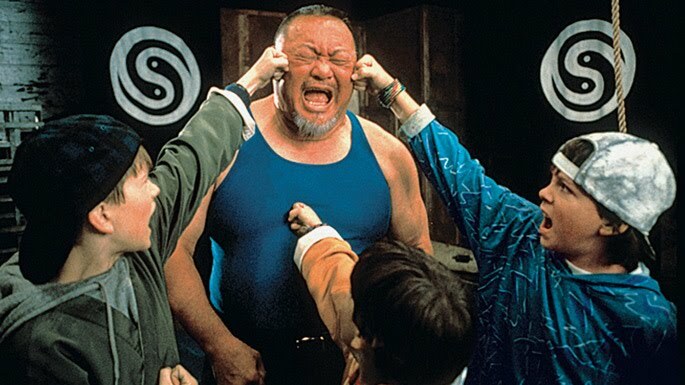 I can’t think of any other reason why such a poor decision would be made on what was otherwise a classic film, 3 Ninjas! 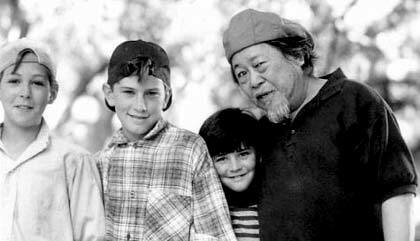 3 Ninjas is about three brothers Samuel, Jeffrey, and Michael. Their parents have never heard of shortening names to Sam, Jeff, or Mike. This is never mentioned in the film but why would all three of the kids have their dorky birth certificate names? These three kids are clearly 100% Caucasian yet for some reason they have a full-blooded Chinese grandfather. Even the mother who is supposed to be half-Chinese has giant bug eyes. I guess this is why the movie was for kids. Only a child would accept this racial inaccuracy. Each summer the boys go to their grandfather’s where he teaches them about ninja stuff. The grandpa gives them all masks and nicknames. Samuel becomes Rocky, Jeffrey becomes Colt, and Michael becomes Tum Tum. I don’t know what any of these words have to do with ancient Chinese martial arts but remember, we’re already pretty sure the writers know nothing about keeping things accurate. While at the grandfather’s a bunch of ninjas come and the boys fight off these adult ninjas. Apparently some bad guy with a pony tail wants something from the grandfather. He doesn’t get it so he cordially leaves. This same bad guy has been tracked by the boys’ father, an FBI agent. He has a really cool exit scene where it looks like he’s cornered but then a helicopter swoops in and he hangs on the rope ladder as it flies away. For as inaccurate as the film was it did have some pretty cool scenes. To get back at the FBI Agent father, the pony tail bad guy has his assistant hire his surfer nephew and his friends to kidnap the boys. These guys are typical 90s California surfers. They’re complete idiots and talk like ninja turtles. When they get to the house to kidnap the boys the best part of the movie happens. At this point the film turns into Home Alone. After the kidnappers disguise themselves as a pizza delivery man and throw the pizza in the babysitter’s face then shove her in a closet, the boys get quick to action in setting up a few traps. They’re not really booby traps as much as they turn off the lights and hide in closets. When the kidnappers come looking for them they jump out and fight them. I swear, it’s better in the film. A running gag is that Rocky is in love with the next door neighbor Emily. Rocky looks like if this was real life he’d be really popular. Emily is what you would call a homely little girl. She has a weird Amy Schumer thing going on with her face. After the surfers have been kicked, punched, and the main one should have head his head ripped off after a belt is tied around his neck and the one kid uses it as a rope, Emily comes over. The two other kidnappers who didn’t have a belt tied around their necks had already drunk some sort of liquid with medicine in it to give them diarrhea. Here’s pretty much what happens to end this epic scene. I would just like to point out how stupid Emily came over to their house knowing something was wrong. She finds a cup of liquid sitting on the table then thinks “Hey, I’m going to drink this.” How thirsty is this girl that she goes over to neighbor’s houses and drinks random cups of random liquids she finds? Emily deserves to get diarrhea. The ponytail bad guy has henchmen show up and kidnap the boys. They’re brought to a large boat where they’ll be held hostage. The Chinese grandfather finds out about this and sets out to rescue them. Somehow between the Chinese grandfather and the 3 kids they fight off a bunch of well-trained bad guys, mostly with cheap shots to the groin. 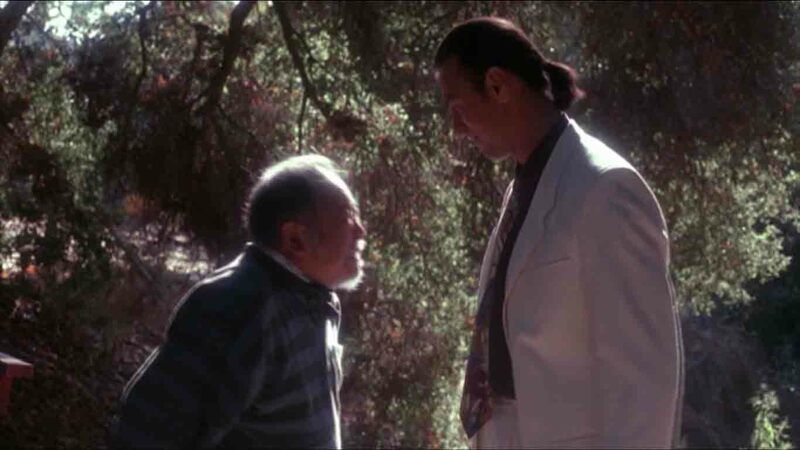 The final battle comes down between the Chinese grandfather and the ponytail guy. The ponytail guy is going to kill the grandfather but before he does he panders to the crowd. Tum Tum (whose gimmick is being fat) had already slipped some gummy bears to his grandfather for some reason. The grandfather throws them into the ponytail bad guy’s mouth then he chokes on them. I think he gets shot by the FBI when they show up too little too late. This film spawned a few sequels, none of which I ever saw. The original is a classic 90s film with implausible plots, crazy characters, and poop jokes. The rest aren’t worth seeing. One takes place at an amusement park and Hulk Hogan is in it. That’s plenty to let you know you’d be wasting your time watching anything but the first. This entry was posted in Live Action Movies, Ninjas and tagged 3 ninjas, bad guys with ponytails, colt, film, humor, movies, rocky, tum tum. Bookmark the permalink. 3 Ninjas (and yes, the numerical “3” always bothered me too), came out when I was pretending to be above kid movies which means that I was busy being 13 and prank calling kids from school. I remember that the cover of the movie was in all bright neon which was just an assault on my precious eyes. The third one has Hulk Hogan on the cover. That’s much more offensive. This movie was always on the WB over the weekends. If I could grab one thing from my past I think it would be sitting around on the weekends flipping through the channels hoping I could find a good movie. So much great nostalgia. Did you have HBO growing up? Did you ever see Troll 2? Never had HBO anywhere. I know Troll 2 is the worst movie ever but other than that I’m not too familiar. I hope this isn’t one of those “the title character looks like you” comments. Haha no, but you need to get on that and see it. It’s on Netflix and it is worth your while. It’s not bad in a Gigli sense but more of a massive head injury sense. Hahaha… Three ninjas was awesome in a really horrible way. Sadly, I watched one of the many sequels as well. Speaking of horrible movies to add to your growing list of recommendations, you should check out Thankskilling. It’s hilarious. I haven’t seen the sequel, but in the trailer they make a special point to explain that they skip straight over Thankskilling 2 to Thankskilling 3. One of the catch phrases of this excellent movie was ‘gobble gobble mother f#*ker’. Thankskilling sound terrificly bad. Have you seen Santa’s Slay starring the wrestler Goldberg? It’s actually not half bad. Sounds like a seasonal classic! count me in! I really loved this movie but I haven’t seen it in five-ever (longer than forever). I always loved their masks. And I love how that moment is your favorite Kid’s Show moment ever of all time. It’s pretty good though. Yeah, WHY IS SHE SO THIRSTY? Who just drinks out of random cups? That’s how you get date raped. That scene always stood out to me even when I was younger. This is one of those movies I could see someone buying me and then I watch it once because there are no good special features. It’s not like they even had a really clever line about her drinking the diarrhea liquid. I like to think there was a whole back story about how Emily’s parents couldn’t afford to have the water turned on and she only ate saltines. This explains her extreme thirst. That’s why I spell it out in my name.